BT3 PRO support for Windows 10 system TV BOX can change traditional TV, LCD Monitor or projector with HD port into a multimedia center by connecting the Internet (Via WiFi or RJ45) It combines the Internet and the traditional TV to build a new entertainment system, making you greatly enjoy videos, music, photos, etc. BT3 PRO TV BOX is equipped with Intel Atom x5-Z8350 Processor Intel CPU and Intel HD Graphics 400 Processor Graphics. Its high machine configuration gives you ultra-fast running speed and smooth image processing performance. It runs with support for Windows 10 system which is rapid and stable configuration. Watching TV shows, movies; browsing webpage and photos, as many as you like. It connects to any TV with an HD port. As long as it connects to WiFi, you can watch and play whatever you like. Based on H.265 HD decoding, it offers 4k * 2k output which provides you high definition viewing and fluent video playing. You can view every single detail in the picture, and experience the real color in the world. 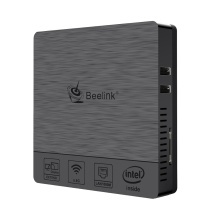 It supports 2.4G/ 5.0G Dual-Band WiFi with BT 4.0, also supports max 1000M Ethernet. 4GB memory and 64GB storage for you to enjoy the smooth streaming.